How to compress videos at any resolution (4K, 1080p, 2160p, etc.) and any format (AVI, AVCHD, etc.) for YouTube uploading on Windows and Mac OS, including Windows 10 and OS X 10.13? We like to watch and download YouTube videos created by other members, and also we are happy to upload our GoPro videos, gameplay videos and others to YouTube for sharing and getting attention. However, the most common problem getting in the way of uploading is "the file is too large". Setting aside YouTube's limitations on video file size and length, uploading a large video consumes extensive bandwidth and requires hours and hours for finishing video uploading. So, it is necessary to figure out how to compress videos for YouTube but maintaining good video audio quality. And the best answer to this question will be presented here. 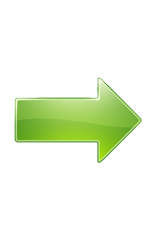 The method introduced here will help people compress videos in MP4, MKV, AVI, WMV, AVCHD, MTS, MOV or other formats at any resolution including 1080P/i, 4K 2160P and 8K 4320P to meet YouTube video uploading requirements. 1. Find the best video compressor for YouTube. Then download and install it on your PC or Mac. 2. Figure out the requirements for YouTube video uploading, including YouTube supported file formats, video file size, file length, aspect ratio and more. That's really a troublesome work. But don't be worry, because this article has compiled all these things for you. Compress videos by changing video codec, trimming off unwanted segments, etc. 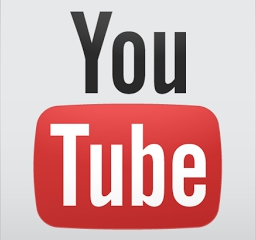 With optimized YouTube presets, users can compress any videos for YouTube easily. Video compression software is not difficult to find in the market. But it takes much effort to single out the top video compressor for YouTube. After comparing with top 3 video file compressors, we finally pick out WinX HD Video Converter Deluxe to compress video files for YouTube. It is chosen, because of the following reasons. ◆ Meanwhile, Deinterlacing feature can help people convert interlaced video to YouTube accepted progressive scanning video. YouTube requirement for file size: 2GB. But using an up-to-date browser will get you 20GB and increasing your limit will get you 128GB. How to Compress Videos for YouTube Upload on Windows and Mac? To start with, download, install and launch the proper video compressor edition on your computer. Step 1. Load the video(s) you want to compress for YouTube. You can easily input the video(s) by clicking the "+Video" button, or dragging & dropping the target video(s) to the main interface of WinX compressor. Step 2. Select the output profile. From the auto pop-up Output Profile panel, go to "Web Video Profile -> YouTube Video" and select out your desired output format. You are recommended to choose the first one MP4 with H.264/AAC codecs as the result. Then press Ok button. Tip: Although using H.265 HEVC is very effective in compressing video file size, it isn't officially supported by YouTube yet. Step 3. Edit videos to compressing file size/length for YouTube. Clicking "Edit" button will enable you to crop off unwanted parts, remove unnecessary clips by trimming, add external subtitles or disable subtitles, etc. If you want to tweak the video audio parameters settings, for example, bit rate, frame rate, video resolution and aspect ratio, simply click the gear icon. Tip: While compressing videos for YouTube, you can refer to the recommended upload encoding settings to adjust the video audio parameters. Step 4. Specify output folder and begin compressing video for YouTube. You can click "Browse" to select any folder as you like to store the output. When all settings are finished, just tap "RUN" to get access to the video compression process. After that, you can upload the compressed video to YouTube as instructions. 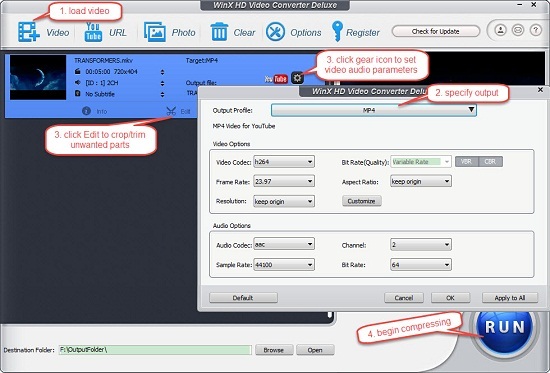 If you need the most powerful yet easy tool to compress any videos for YouTube, Facebook, Vimeo or other websites, WinX HD Video Converter Deluxe deserves a shot. It is also worth mentioning that this tool can also free download SD/HD/4K/8K videos/movies/songs from YouTube, Dailymotion and other 300+ video-sharing sites.